Listen up, Toyota—relocate the brake pedal! Listen up, Toyota—relocate the brake pedal to save lives! This is my suggestion to Toyota and to all the world’s automakers. The first company that accepts my concept and converts its models in accordance with that concept has a unique opportunity to make a quantum leap ahead of every other automaker in the world. There should be no more sticking accelerators, and claims that the accelerator malfunctioned and contributed to an accident should be reduced or completely eliminated. Also it is my sincere belief that my suggestion, if adopted by all the automakers, would significantly reduce the number of rear-end collisions. Move the brake pedal to the left side of the steering post, just as the gas pedal is to the right side of the steering post, then institute the go, no-no concept for controlling automobiles. Color the pedals red and green, with dashboard lights prominently reflecting the use of each—the brake pedal red for stop and the gas pedal green for go, just as traffic is controlled as directed by red and green traffic light signals. Simple, huh? Make those dashboard lights prominent enough to alert any driver that the wrong pedal is being used. If you want to stop or slow down an auto and the green light is on, you are using the wrong pedal, and conversely if the red light is on and you want to go, you are using the wrong pedal. And car makers perhaps should consider adding a warning horn system and voice announcements similar to those used on commercial planes to alert the pilots in situations such as landing gear not down and locked, or airspeed is too high for landing. And on the subject of airplanes, in the absence of an autopilot system the pilots of those conveyances use their hands on the controls to manipulate the ailerons left or right to tilt the plane to one side or the other. They also use their hands on the controls to manipulate the elevators, pushing forward to push the nose of the plane down and pulling back to put the nose of the plane up—can you guess what they use to manipulate the rudder to make a turn, either to the left or the right? If you guessed that they use their feet to manipulate the plane’s rudder, you win the stuffed teddy bear. Yep, they push in with the left foot to turn left, and push in with the right foot to turn right. I feel that we can equate the functions of foot pedals on a plane to an automobile’s brake and accelerator pedals. Our government apparently believes at least some of such accidents were caused because the driver confused the accelerator with the brake, and accelerated the car’s forward motion instead of slowing it, a conclusion that in my opinion appears valid. One needs only to observe the proximity of the accelerator and the brake pedal. In a case of a runaway automobile, the first instinct is to get off the accelerator and hit the brake. In such cases the driver gets off the gas and goes for the brake, but because of the proximity of the brake pedal to the gas pedal, the driver simply hits the accelerator again and thinking that the foot is on the brake, holds it firmly on the accelerator up to the point of impact. The error is caused by the fact that the right foot is used both for slowing and stopping and for achieving, maintaining and reducing the vehicle’s speed. In a case of a runaway auto, the driver takes the right foot off the gas pedal to change to the brake pedal then, under extreme stress, simply returns the right foot to the accelerator instead of the brake. And at this point I must note that throughout all this action, the left foot is available but doing nothing to help out—oh, if an accident is imminent the left foot is probably exerting tons of frantic foot-pounds (get it?) of energy against the floorboard but it’s energy wasted, and that pressure will probably result in major damage to that stiffened left foot, leg and hip of the driver if a major accident occurs, plus extra stress on various related internal organs if a major accident occurs. I am passing my suggestion on to the automakers in an effort to bring the auto industry into the twenty-first century—yes, it’s still in the early twentieth century. Before I continue let me establish my right to speak on this subject. I began driving at the age of 12 and have been driving motor vehicles of every size, weight, color, horsepower and style including personal cars and trucks, US military and US Civil Service government vehicles for the past 66 years. For the first eight years of that 66 years I used my right foot to accelerate, maintain and reduce speed and to slow and stop vehicles with manual transmissions—the left foot was reserved exclusively for the clutch operation. For the past 58 years I have used my right foot for go and my left foot for no-go, and I intend to use my feet in like manner for whatever number of years I retain the privilege of driving before being curtailed by old age—or otherwise. In those 58 years I have never had an accident involving an attempt to occupy the same space as another object, whether the object was mobile or immobile. Conversely, in the first 20 years and in my first automobile, I had a head-on collision with an immovable object, namely the corner of a concrete retaining wall on a beach in Jacksonville, Florida. I was alone and the hour was late and the night was dark and I was in strange surroundings, and I missed a turn and found myself on the beach. And on that dark night and at that late hour on a beach I learned an immutable truth of physics, namely that no two objects can occupy the same space at the same time. I had a head-on collision with the corner of a concrete retaining wall on a beach in Jacksonville, Florida. Traveling along beside the high concrete retaining wall that overlooked the beach, I saw a break in the wall ahead and I started a right turn in order to leave the beach and return to the highway. In retrospect, I don’t believe I reduced my speed before beginning the turn, and I saw the 10-foot high wall rushing toward me at a high rate of speed. As I went into the turn my lightweight high-center-of gravity 1948 Chevrolet coupe raised up on its two left wheels, so I spun the wheel left to get all four tires on the ground, intending to stay on the beach instead of turning over or hitting the wall. Yes, spun—my steering wheel boasted a suicide knob, an add-on that enabled young punks such as I to spin the wheel swiftly with one hand. Read on, and you’ll learn why it was labeled a suicide knob. I was partially successful with my spinning the wheel to the left. I managed to avoid rolling over, but I hit that wall right at the 90-degree point. Whatever my right foot did, whether it hit the brake, stayed on the accelerator, or left the brake and returned to the accelerator was not enough to avert significant structural damage to the auto and to me—the retaining wall suffered only minor scratches. I struck the wall at the corner point where it came down to the beach from the highway, and there the wall made a 90-degree turn to the right. I would have been satisfied—nay, happy even—with side-scraping it, either to the left or to the right but preferably to the left, so the contact with the wall would be on the opposite side from where I sat. The only other part of my anatomy that could possibly have been instrumental in preventing the accident or reducing the damage wrought was my left foot, and I have no recollection of any helpful action taken by that worthy. I had a habit of resting my left foot on the clutch pedal and may have been doing that just before I hit the wall, so the only action the left foot could have taken would have been to push the clutch pedal to the floor, thereby disengaging the gears, decreasing the drag of the transmission and thus increasing the speed of the car en route to the retaining wall. 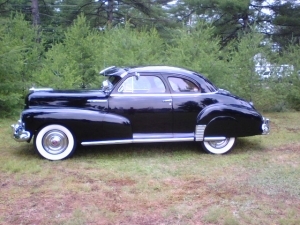 My 1948 Chevrolet business coupe with a vacuum-shift manual transmission survived the collision. Both the coupe and I suffered front-end damage, major damage to the coupe but relatively minor to me. I unwittingly— and unwillingly—used the bridge of my nose against the steering wheel to slow my forward motion, and managed to break both the wheel and my nose on impact. I suspect that chest impalement and other significant—perhaps fatal—injuries were prevented by my habit of leaning to the left while driving—when everything stopped moving my body was wedged between the left door and the steering column with its broken steering wheel. A few weeks after eliminating my paltry accumulated savings to recover the Chevrolet coupe from the body shop, I immediately traded it for a sky-blue 1951 Ford convertible with an automatic transmission, and a whole new world opened up for me. I quickly learned that rather than using the time-honored and time-wasting two-part action of lifting the right foot off the accelerator and placing the same foot on the brake to slow or stop the car, I could use my left foot on the brake and needed only to reduce the weight of my right foot on the gas. When an accident is apparently imminent the driver must lift the right foot off the gas, move it over to the brake pedal and push hard, and perhaps avoid an accident. But what if the foot when lifted is not lifted high enough and moved far enough to the left, and the sole of the shoe hooks on the side of the accelerator, or the sole of the shoe is not placed squarely on the brake pedal and slips off to the right and back on the accelerator? Disaster is imminent, and even milliseconds saved could mean the difference between life and death. In summary the crux of my suggestion, and this rambling post in support of it, is that the left leg and foot do nothing to assist a driver in operating a motor vehicle. It remains idle while the right foot is constantly at work, moving from gas pedal to brake, and from brake to gas pedal, ad nauseam. If the left legs and feet of drivers could speak, they would probably say that they would like to be involved in the vehicle’s operation, and would probably claim that they could do a better job than the right, much as the political left in our nation feels about the political right. And furthermore, I’ll bet that an atrophy study of the legs and feet of drivers would show that the left is far more susceptible to the disease than the right caused by lack of use, simply because it is allowed to stagnate while the right does all the work—and there again it appears that a parallel can be seen in our political parties. Postscript: There’s more to the story, including my involvement with a sheriff’s deputy, the US Navy’s Shore Patrol, the people that returned my 1948 Chevrolet coupe to service, and what happened in Jacksonville the night I recovered my car and entered the city over a high bridge and lost my brakes on the way down to street level, and I’m even less proud of that than I am of my bout with the retaining wall. However, I’ve rambled on too long already, so I’ll save the rest of the story for a later post—stay tuned.